Qantas has applied to share codes with Cathay Pacific on flights between Australia and Hong Kong. The airline has applied to the International Air Services Commission (IASC) to permit that. In an accompanying letter to the IASC, Qantas’ acting head of international affairs, Megan Morris, wrote: “As part of a code share agreement between Qantas Airways Limited (Qantas) and Cathay Pacific Airways Limited (Cathay Pacific), it is proposed that Cathay Pacific will offer code share services on flights operated by Qantas on the Hong Kong route from 31 March 2019”. Morris added that a copy of the confidential code share agreement between Qantas and Cathay Pacific would be provided separately to the IASC. Qantas flies nonstop from Brisbane, Melbourne and Sydney to Hong Kong, using a variety of aircraft, including A330s, A380s, B787 Dreamliners – even the venerable B747. 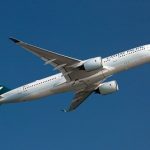 Cathay Pacific flies from Hong Kong to Australia’s four major gateways: Brisbane, Melbourne, Perth and Sydney. Together, they constitute a formidable force on the route.